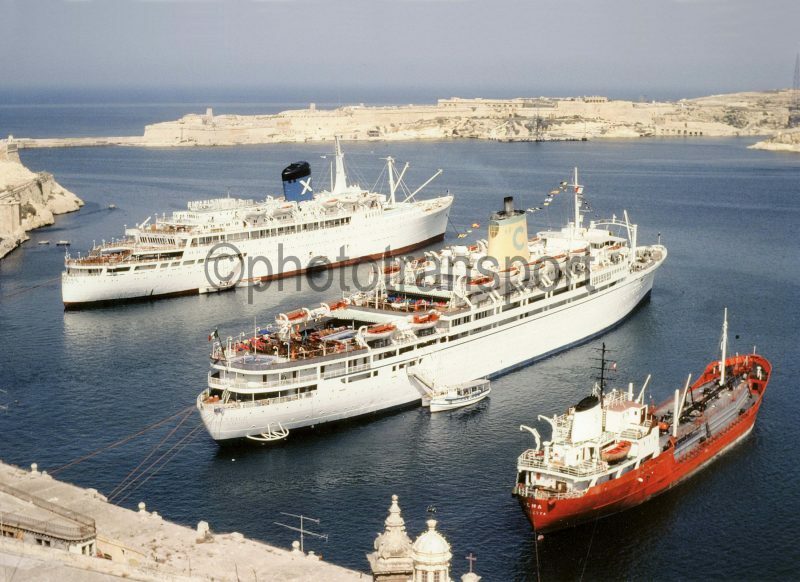 Valletta Harbour in 1977. On the left is the 17,041grt Chandris cruise ship Amerikanis which was built in 1952 by Harland & Wolff at Belfast as the Kenya Castle for Union-Castle Line. She joined Chandris in 1967. On 12th June 2001 she arrived at Alang to be broken up by Shree Ram Vessel Scrap. In the centre is the 15,889grt Costa cruise ship Enrico C which was built in 1951 by Swan, Hunter at Low Walker as the Provence for Soc Generale de Transportes Maritimes a Vapeur. She joined Costa in 1965 initially as Enrico C and from 1987 as Enrico Costa. In 1994 she became Symphony of Mediterranean Shipping Co. and in 2000 she was briefly chartered to Golden Sun Cruises as Aegian Spirit. In 2001 she became Ocean Glory I of Festive Holidays but was laid up at Dover due to her failing hygene tests. Later that year she was renamed Classica for her final voyage to Alang where she arrived on 4th November to be broken up by Goyal Traders. On the right is the 2,268grt Wena of Kara Shipping which was built in 1965 as the Lena for OT-Rederierna of Sweden. She became Wena in 1977 and in 1984 she was sold to Philippine Transmarine Carriers and renamed Prince Arac. On 10th November 1986 she sank off Ecuador following an explosion in one of her tanks. One crew member lost their life.